In year 7 students will acquire knowledge of health and safety, healthy eating, basic nutrition and the different pieces of equipment. The practical skills are developed through the following practical dishes; Pizzas toast, Flapjack, Couscous salad, Tuna pasta salad and Savoury rice. It is assessed through a piece of written work as well as a practical dish. In year 7 students will acquire knowledge of health and safety, where fabric comes from and how it is used within garments. The students will design and create a cushion using felt fabric. Through this the students will learn how to use basic hand sewing techniques e.g. running stitch, cross stitch, how to sew buttons and beads as well as making their own patterns. It is assessed through the design as well as their final outcome. In year 7 students will acquire knowledge of health and safety, accurate marking and measuring out, use of CAD packages as well as hand held tools. They will be working with a range of materials, including Metal, Plastic and Wood and will acquire knowledge of the properties of these materials. The students will design and create a coat hook which the students will need to measure, drill and hammer into shape. They will then use the powder coat their hooks with plastic. In year 8 students will acquire in-depth knowledge on nutrition and different nutritional needs. The students, as their theory assessment, will have to analyse a diet and give improvements. The practical skills are developed through the following practical dishes which are focussed on high risk food. The practical’s are: Ragu Sauce, Chilli con carne, Spaghetti Bolognaise, Macaroni Cheese and Sweet and sour chicken. In year 8 students will acquire knowledge of health and safety, where fabric comes from and how it is used within garments. In year 8 students will acquire a deeper knowledge of quality control, finishing techniques, customer needs and wants as well as CAD skills. They will be working with predominantly wood – learning about different joints as well as testing different joints out. They will be creating a jigsaw product, which is used as a promotional gift for a certain client / customer. The students have to research a client and have to design a jigsaw suitable for them. There is a key focus on designing and presenting creative ideas. The practical skills are developed through the following practical dishes which are focussed on implementing the knowledge they learn from the experiments. The practical’s are: Chelsea Buns, Naan bread, Focaccia and Yo-Yos. This will also develop their dough making skills. In year 9 students will acquire knowledge of complex CAD software, Space Claim, and will use this software to complete a range of different designs. They will learn about the different tools, as well as using key terminology. They will evaluate their designs. It is assessed through the design as well as their final evaluation. In year 9 the students will acquire a deeper understanding of how to use 2D design as they will start a Jewellery project. Here they will use 2D design to create their own mould, a complex skill the students will have to master. From this, they will cast their own piece of jewellery and will be expected to finish it to a high standard. They will also be focussing on packaging and will create their own net to house and advertise their jewellery in. There will still be a focus on design and the students will be expected to create unique designs however presented creatively. 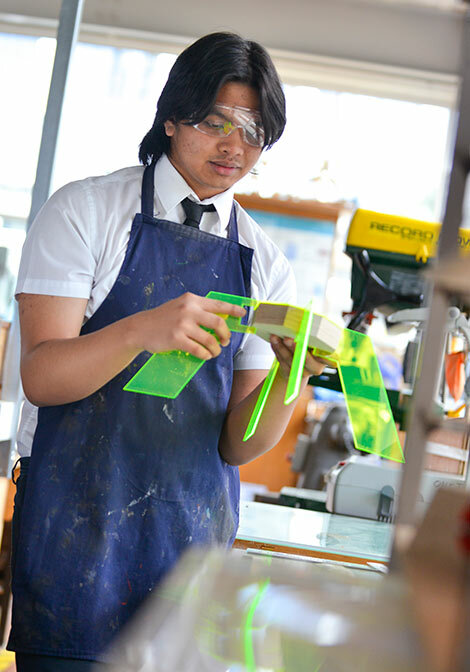 The new product design GCSE focusses on many areas of design, and students learn to think creatively and intervene to improve the quality of life, solving problems as individuals as well as members of a team. The new GCSE has strong links with the Science GCSE as well as containing 15% maths. 50% of the GCSE is in the form of a NEA (Non Examinned Assessment) which is a 35 hour design and make task. AQA will release the title in June of year 10 and the students have to research, design and make a product to suit that brief. It gives students the opportunity to work as an actual product designer. Throughout this project the students will have to; conduct primary and secondary research, create models and prototype of products, test different componants and materials and will used computer modelling. 50% of the GCSE is in an examination element where the students will be tested upon a range of topics including material areas, work of others as well as design and make principals. All theory is taught in Year 10 and revised during year 11. The new A-Level gives students the opportunity to create their ownproject and look in-depth at the industrial techniques and processes used within manufacture. It gives students the ability to match up products to their manufacturing method as well as an in-depth look at their finishing techniques. The new A-Level compliments Science and Maths A-Levels as 15% of it is Maths and there is a significant cross over between the Science A-Level and Product Design. 50% of the course is based upon two exams that will be held at the end of year 13. He other 50% of the course is based upon a design and make project, whereby the students pick an area they want to investigate, they then design and make a product to solve their problem. Previous projects have included an: Artists easel, Mannequin, Bookcase, Bench, Lighting and Tables. This project is a substantial product and will take around a year to complete.